Booknotes & Politicians · Booknotes & Politicians · One Book. One Author. One Hour. Political leaders often write books on diverse topics, including foreign affairs, their years of public service, and history. Several high-powered national and international political leaders appeared on “Booknotes”. Politicians were attracted to the program’s serious audience, fair and balanced reporting of issues, and the care Brian Lamb took in preparing for interviews. “Booknotes” provided the distinct opportunity to hear major public figures discuss the issues, their lives, and their writing styles in an uninterrupted, hour-long format. 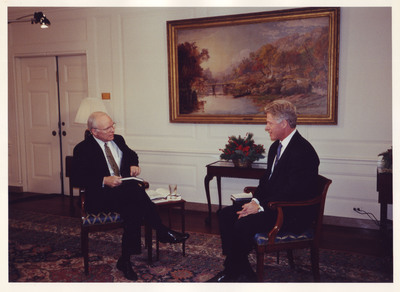 Here President Bill Clinton sits down with Brian Lamb to discuss his book, Between Hope and History: American’s Challenges for the Twenty First Century, on December 15, 1996. The book outlines the Clinton administration’s challenges and successes during their first term and discusses their hopes for the second term. This interview provided the unique and useful perspective of hearing from a sitting American President what he thought his next steps should be during a long format interview. For future scholars it helps to provide a snapshot of the Clinton years. Unlike most “Booknotes” interviews which were filmed in C-SPAN’s offices, this interview was filmed in the White House. Such high powered guests sometimes required changes to the standard “Booknotes” procedure. President Richard Nixon’s 1992 “Booknotes” interview also departed from the norm. Nixon shot a rare two-part, two-hour interview to discuss his book Seize the Moment: America’s Challenge in a One-Superpower World. 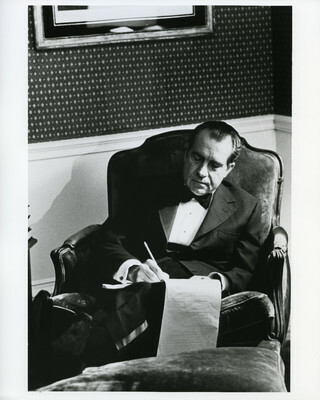 Here President Nixon is shown writing in the White House. With such powerful individuals appearing on their program, even the professional “Booknotes” staff could be impressed by their guests. In her March 2015 oral history interview, former C-SPAN Senior Producer Sarah Trahern recalled being awestruck by the former President, with whom she chatted about baseball before his interview. Memoirs and foreign policy books penned by world leaders often appeared on “Booknotes.” But theses authors’ contributions were not limited to such a narrow scope. President Jimmy Carter wrote a book of poetry, Always a Reckoning and Other Poems, which he discussed with Brian Lamb in 1995. 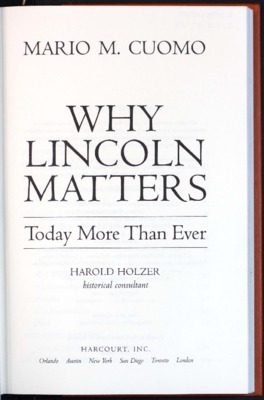 Former Governor of New York Mario Cuomo tackled the subject of Abraham Lincoln in his 2004 book Why Lincoln Matters: Today More than Ever. This book dealt with history, political philosophy, and modern political debate. In this photo President George H.W. 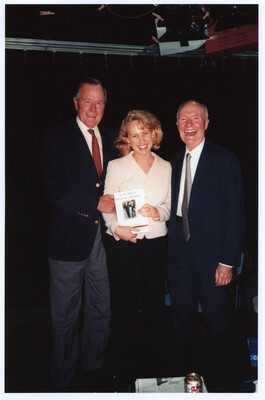 Bush, C-SPAN staffer Carol Hellwig, and Bush’s National Security Advisor General Brent Scowcroft pose with their book in C-SPAN’s offices following the October 1998 appearance on “Booknotes.” Both Scowcroft and President Bush appeared on the program together to discuss the book they co-authored, A World Transformed. Among other topics, this book and interview tackle international relations, the Cold War, and political leaders, including Mikhail Gorbachev. “Booknotes” provided the opportunity to hear about issues from multiple personal and political perspectives. 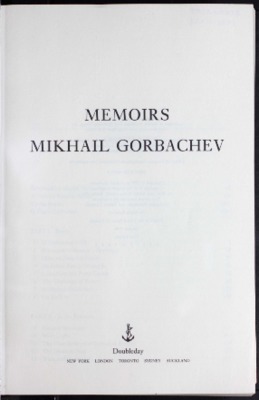 This was the case when former Soviet leader Mikhail Gorbachev appeared on “Booknotes” in 1996 to discuss his book Memoirs. Gorbachev discussed communism, his time in power, the Cold War, and the USSR, providing the American public with the chance to learn about these issues from multiple points of view through the “Booknotes” program. Interviewing international leaders was a great way to broaden the audience’s perspectives, but it had difficulties as well. Gorbachev’s interview, for example, had to be conducted through a translator.